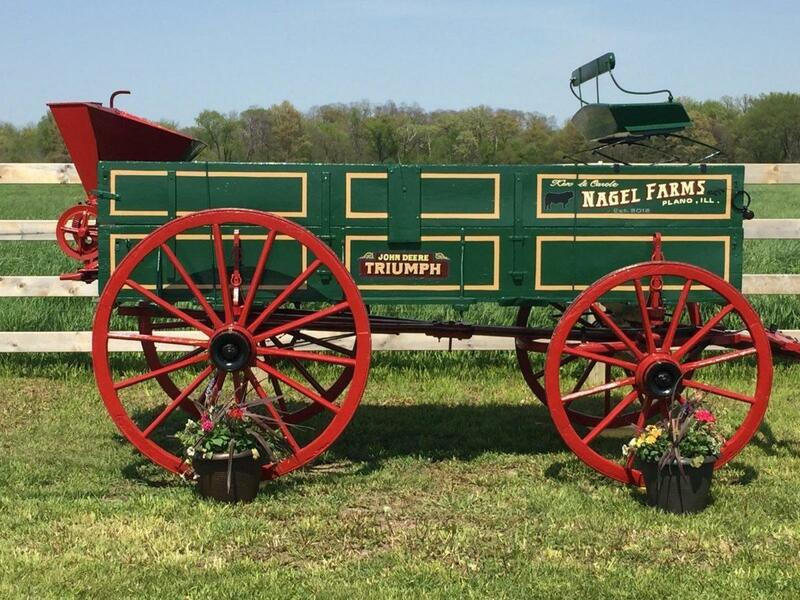 The John Deere Triumph Farm Wagon on display at Nagel Farms is a typical example of one of the 30,000 wagons that John Deere Co. was producing during their peak production years. In 1919, power to pull these wagons (and other farm implements) came from the 26,000,000 draft horses that were stabled in the United States at the time. Gradually the wagons and horses began to disappear from the landscape. Having outlived their usefulness, wagons were often used as decorations, left to rot and rust in the back of farm lots or junked for their scrap value. Today these wagons are quite valuable. 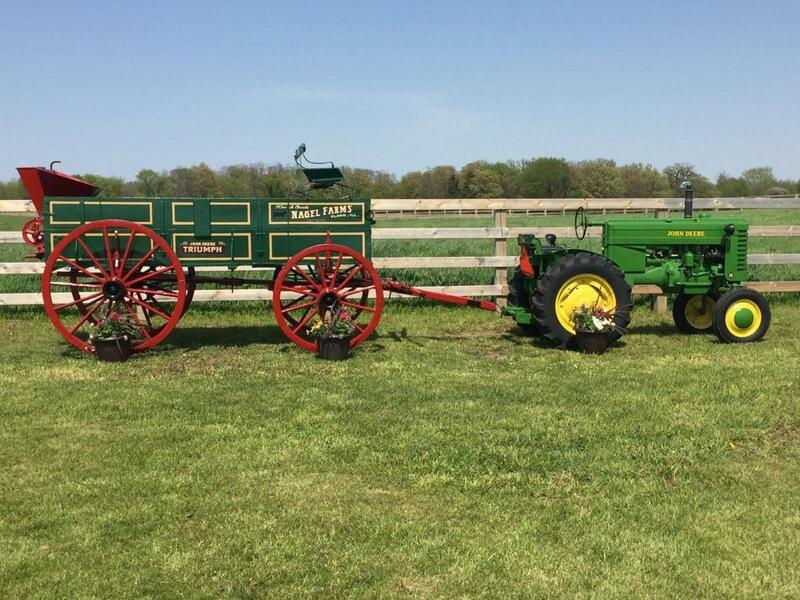 In both original and restored condition, they are not only prized for their nostalgic connection to the rich farming heritage that made our country great and fueled its explosive growth, but are also valued by collectors and historical preservationists. Ken’s wagon was rescued from the ravages of time when he added it to his collection of farm equipment some years ago. There is no documented history of the wagon and the tailgate mounted International Harvester McCormick Deering Seed spreader prior to Ken’s ownership. Research seems to indicate that the wagon was manufactured at the John Deere Wagon Works in Moline, IL. Circa 1910 and spent its life in service on farms in West Central IL. The reasoning behind this educated guess comes from the fact that Deere did not start branding their wagons as ‘John Deere’ until 1910 and that same year the John Deere Triumph Farm Wagon was offered in the *** John Deere Wagon Co. 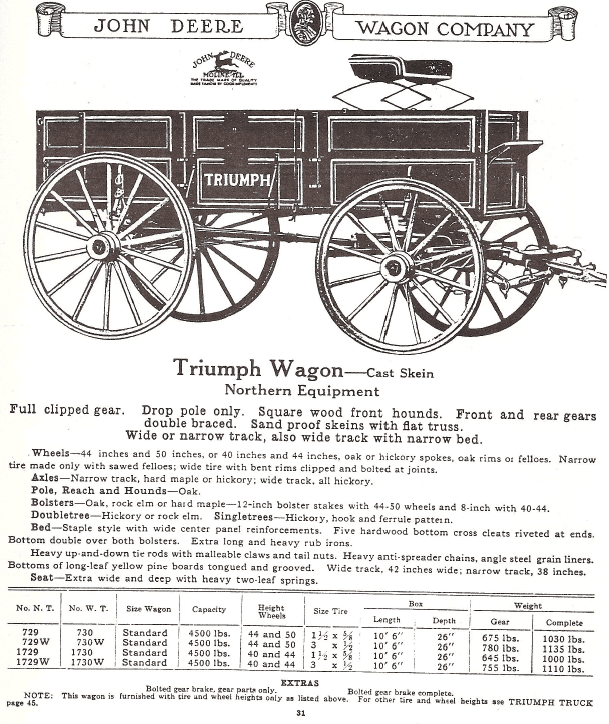 Wagon Catalog. Because it is configured with cast skeins, double box with 26” depth, wide track and 1½” tires it probably was used mostly as a grain wagon. Restoration started in January 2016 and was completed in April 2016. 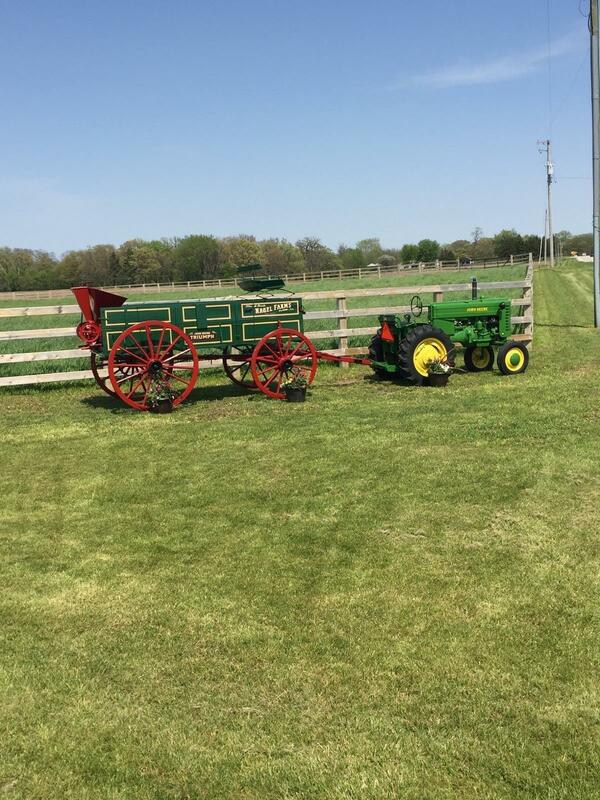 Restoration was carried out by Francisco Reynoso working for Nagel Farms with and under the direction of Bob Baker of Old Coach Works Restorations Inc. at their Yorkville, IL location. Bob’s auto restoration work has earned many national awards for excellence. The original paint, striping and lettering on the box and running gear aided greatly in the restoration. Using photos and faded images from the wagon as templates, the lettering and decorative trim was restored by expert auto Sign Painter and Pinstripe Legend, Pat Finley. Working in the same spirit of quality craftsmanship and attention to detail as the Deere builders did over a hundred years ago these modern day craftsman brought this valuable piece of our farm heritage back to life. Meticulous in every detail, Francisco completely disassembled the wagon, labeling each wooden part, nut, bolt, board and fitting. The wood on the box was carefully reconditioned and then hand primed and painted with three coats of John Deere Green oil base paint. The wooden running gear and wheels were reconditioned and painted red. All metal parts were bead blasted reconditioned, rustproofed and then painted. Two aspects of the configuration of the wagon generate an air of mystery and are sure to encourage a welcome amount of conjecture as to their origin. The wagon came equipped with and IH McCormick Deering wagon mounted seeder and a Mitchel Wagon seat. John Deere made their own tailgate mounted chain driven seeder for wagons so how a McCormick Deering seeder came to be mounted on Ken’s wagon is anyone’s guess. The seeder fits the tailgate and the chain drive set up looks like it was made for the wagon. How a Mitchell seat came to be installed on Ken’s wagon is another mystery? Although J.D. acquired the Mitchell Wagon Company in 1917, at the time it is unlikely that they would have installed a Mitchell seat on a Triumph wagon. The J.D. Triumph model also predates Mitchell acquisition by seven years. Seats and footboards were optional accessories on the Triumph wagon so it is most likely that the wagon was ordered without those options. The Mitchell seat must have been added later on by an owner who required a little more comfort and the Mitchell seat happened to be handy? 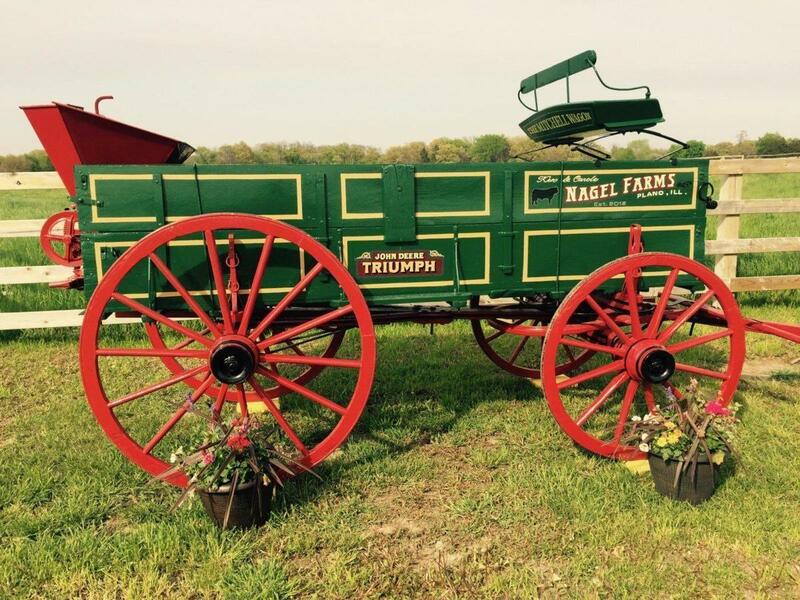 Wagons didn’t come with odometers, serial numbers or registered titles so it is impossible to know for certain the historical details of this beautifully restored farm wagon. The conversation as to its origin and configuration promise to be lively. In an era when small farms played an important role in America’s economy few vehicles were of greater significance than the farm wagon, a technological engineering marvel of the time. If horses and mules were the tractors then the farm wagon was the pickup truck, grain hauler and all around transporter. Its design was both simple and utilitarian, making it sturdy enough for heavy loads over rural roads, and dependable enough for everyday use. *The year is 1880. The United States and Canada are predominantly rural societies. The John Deere Company is seeking new products. The buggy business and wagon trade look promising and are a natural fit with their plows and cultivators. By 1881 Wagons enter the product line. Deere & Co. quickly established itself as a market leader in wagon manufacture by acquiring highly regarded, established builders. By century’s end, company catalogs will feature Old Hickory, New Moline, and **Mitchell wagons, as well as Derby, Red Star, White Elephant, Victoria, Goldsmith, and Sterling buggies. It wasn’t until 1910 that the actual ‘John Deere’ brand name appeared on wagons rolling off the assembly line. At its peak John Deere laid claim to having the largest Wagon Works in the world. The essential raw material necessary to building wagons was wood and Deere needed a lot of it. Through various subsidiaries, the Company owned or controlled 44,731 acres of hardwood timberland in Arkansas and Louisiana holding 2,470,000 board feet of lumber along with the necessary sawmills and lumber yards to process it. During the first World War the John Deere Wagon Works prospered by filling military wagon orders. But, by the mid-1940’s farmers were looking for steel wagons with rubber tires and wood wagon production at John Deere ended in 1947. The connection between the automobile and wagon building business is a direct one. From the beginning of the 20th Century to the end of WW II, two eras overlapped as the horse drawn horse powered era was fading into the past and the horse power of the internal combustion engine raced into the future. By mid-20th century the transformation of the family farm was all but complete. Some wagon and coach builders successfully adapted and started supplying the “horseless carriage” manufacturers with bodies for their engine driven chassis. International Harvester went on to produce its own line of trucks, some designed by legendary automobile designer Raymond Lowey. IH continues to the present day making trucks under the name Navistar. Many automobile companies and coachbuilders with names like Studebaker (Budweiser beer wagon), Fischer Body, Brewster & Co. etc. had their beginnings in the coach and wagon building business. Among them was the Flint Wagon Works in Flint, MI., a small company that was to have a role in the beginning of one of the largest auto manufacturers in America, General Motors. The Flint Wagon Works started building farm wagons in 1882. In 1903 The Flint Wagon Works purchased Buick and moved the company to Flint, where it built the first production Buick automobile in the spring of 1904. That year, Buick made 37 automobiles. A young insurance salesman, William C. “Billy” Durant took over as Buick’s general manager in November of 1904. Durant’s success with Buick led him to form General Motors on September 16, 1908. He subsequently formed the Chevrolet Motor Company, naming it after his friend, Louis Chevrolet, who was a race car driver for Buick. The former Flint Wagon Works factories were used to build the earliest Chevrolets. By 1916, Chevrolet became a GM division and the old Flint Wagon Works factories became Chevrolet Flint Manufacturing. Photos of Chicago and New York City circa 1910 graphically show motor cars, horse drawn wagons and electric trolleys in often monumental traffic jams as the new technology began to overtake and replace the old. In 1902, J.P. Morgan merged the McCormick Harvesting Machine Company and Deering Harvester Company, along with three smaller agricultural equipment firms, to form International Harvester. The seed spreader on Ken’s wagon appears to date circa 1920’s. The most common types of seed spread by a broadcast spreader were grass, oats, wheat etc. Seeding was a two-man operation. It took two men to mount the spreader on the wagon tailgate. To avoid frequent stops and starts, it also took two men to operate the spreader; one to drive the wagon and one to keep the hopper loaded. Usually the field was then disc-harrowed to cover the seed. IH seeders of this type from this era are extremely hard to find. It appears that most began to disappear into the scrap metal yards as wood wagons were phased out of service. **The Mitchell Wagon, Mitchell wagon “Monarch of the Road”. 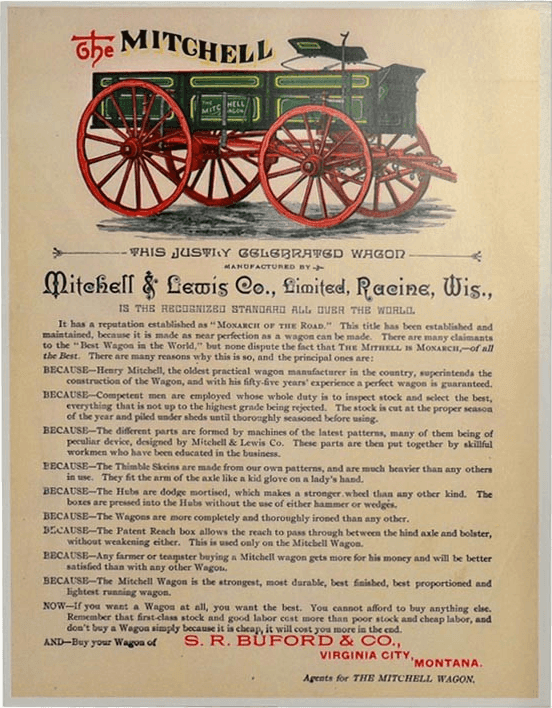 Throughout its history, Mitchell has often been referred to as the oldest wagon company in America tracing its roots to Racine, WI in 1834. Like other firms, Mitchell suffered its own series of financial hardships and growing pains in the early years, but ultimately triumphed into a major western vehicle competitor. Mitchell built a broad line of vehicles including farm, freight, stage, and spring wagons as well as buckboards, delivery wagons, hitch wagons and buggies. They even had their own line of wagon grease. Mitchell’s history not only covers the majority of the development of the old west, but it also played a significant role in the transition from horse drawn vehicles to electrics and gasoline engines in the early 1900’s. Mitchell was purchased by the John Deere company in 1917 and marketed for several more decades before ceasing operations.